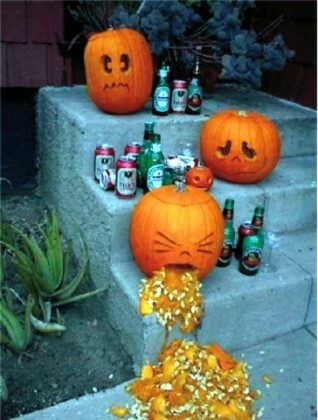 While most pumpkins were busy adorning porches and decks to entertain neighborhood trick or treaters, these jack-o-lanterns were displaying some seriously bad behavior during All Hallows Eve. One of the American native winter squash had at least one too many beers with the result being and eruption of involuntarily spewed seeds and filling. A well behaved pumpkin would not only have provided entertainment to Halloween revelers, but also yielded its filling for pumpkin pies and seeds for salad toppings. Next year, the owners of this house are going plastic.